I think Jarvis Jones will be a top five pick, but if the neck injury and positional questions help him slide to the Seahawks, I’d be psyched. Had he declared in 2012, he would have been the best pass rusher in that draft, IMO. And while I really like Irvin, Jones is hardly a designated pass rusher, he can do it all and I think his versatility would be a big plus as the LEO role is intended for hybrid DE/LB types like Chris Clemons. No doubt about Jarvis Jones, elite propsect in any class IMO. I do really like some of the WRs that could be available in the second half of round 1 (similar to the Britt/Nicks draft). Justin Hunter,Da’Rick Rodgers, Terrence Williams. I think Cobi Hamilton will climb a lot. 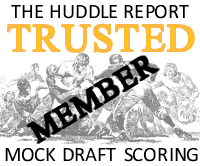 And Ryan Swope, nice player/prospect, will go a little later than he should because he’s white – but like Jordy Nelson could prove to be someone that should be a 1st rounder. Nice summary on prospects Rob. Totally agree Kip – would love a Jarvis Jones pick next year. Once again I’m rooting for Landry Jones to raise his draft stock so some other team will take him early. Tyler Bray is another guy I’m rooting for to continue being over-rated. Bray reminds me a ton of Nick Foles- awful footwork and mobility with nice numbers but all from a 1 read offense. Even with Russell Wilson and Matt Flynn, I still have my eye on QBs in 2013, especially if for any reason Matt Barkley slides out of the top 5. I can’t wait for the college season to get going. As a fan of your site I have to imagine that it’s a bit hard to churn out the material at this time of year….could be wrong…. Besides Star Lotulelei, are there any other interior d0linemen you like? From memory, I thought Werner was a DE? I’m stoked on the Jason Jones signing, this last year, but I still think seattle would totally benefit from more pressure inside (which team wouldn’t?) I like Branch and Mebane, and maybe with excessive pressure coming from the edges they would be able to get to the Qb as well, but I’m starting to think they may be tapped as far as potential and dominance goes…. Kip, I hear you on watching the QB’s this year. I’m kind of hoping Wilson, Bray, Thomas, Jeff Teul, the kid from Kansas State Colin Klein, and a whole host of others tear it up this season…though I think Seattle may need to look at QB once again (I sincerely hope not and do hope one on the roster takes over) what my bigger hope is for a truly dominant WR, an abolute game changer force to be reckoned with…I do not know who that may be at this time….or one or more pieces to the defensive front seven ala NY giants and their awesome rotation, but coupled with our hopefully great backfield. Point being, let’s let a whole ton of QB’s rise to the top, and Seattle hopefully gets to stay out of the conversation this year for that position, so we can go one and be one fo those teams that pick the player they want, and not something they need. Like this last draft…only with out the snickering from the media! Exciting group of QBs, a few WRs, and if he declares and is healthy Marcus Lattimore. I have to say I’m not a big fan of Montee Ball, though he appears to be better than a lot of draft-eligibles for 2013. I like Andre Ellington for an all-purpose back. Hunter, Allen, and Rodgers at WR so far seem to be quality. I haven’t paid a ton of attention to the defensive side, yet. Rob, your early analysis of a weak draft class appears to be right on. No doubt there will be a few good players there when the Seahawks pick, probably in the middle of the round based on their brutal schedule, and questions at QB (and now RB). The issue is, will the available players be at positions of need? Despite what John and all other GMs say, you don’t go for best available player, but for best available player at a position of need, based on a priority-of-need ranking system. Certainly, John and Pete’s draft picks thus far have all been for positions of need. The comments above are correct that the needs are likely to be another Leo (if Clemons doesn’t sign an extension) to pair with Bruce Irvin; a WR unless Lockette or Durham have a break-out; and more depth at DL. God forbid the Seahawks will have had such a miserable 2012 season that they need to draft a QB in round one. The QB class is way down this year…no one even close to Luck or RGIII, and the best 2012 guys no better than Tannehill or Weeden. Honestly, I believe Russell Wilson is a better prospect than Barkley. If the Seahawks have struck out on both Flynn and Wilson so badly that they would go QB in R1, time to start rooting for the Titans or just watch replays of the college games on Sunday afternoons, and wonder how long until Paul Allen goes looking for a front office and coach that can land a franchise guy. TE is the new WR, so I wonder if the Seahawks will look for a TE in R1? I watched the replay of the great 49ers/Saints playoff game on the nfl network today, and the game was completely dominated at the finish by Graham and Davis, two superior athletes that could not be covered by CBs, LBs or Safeties. So who exactly does guard them, if you don’t have a Kam Chancellor? Anyway, after watching Gronkowski and Hernandez turn the league upside down, and then Graham and Davis, it is clear that the emerging trend is not for a #1 WR, but for a TE, or better yet, two, whose size and speed makes him impossible to cover. The Seahawks will be lucky to get one more good year from Winslow, and Miller is a solid but not spectacular athlete, so TE might be the pick if they go offense. It may be short on headliner talent. But even in some of the weak headliner drafts we’ve seen recently — which is how this crop is being compared, there is always talent there to be developed. Even if you look at 2006 and 2007 — those drafts were pretty lousy at the top. But plenty of pro bowl talent and quality starters to be had down the line. Maybe it was luck, but teams established championship talents in 2006 (GB and NO) despite getting mild results from their #1 picks (Bush and Hawk). In 2007, you see GB, NO and SF all doing well late. Laying the foundation for future success even in down years. A team with good talent evaluation skills can really separate themselves from other teams even in lean years. Seattle can really separate themselves from the pack if they can manage to reproduce some of that late round success they’ve been able to do repeatedly. If it is a down year, then we will have to be satisfied with the knowledge that the teams that do well will not be known by us. It will come down to guys that can develop beyond what we can see, and guys drafted for specific roles that they can succeed in better than in college. The visionaries will be the winners as opposed to the analysts. Nicely done Rob 🙂 I think you should take the time to check out John Simon, DE for Ohio State. He plays with the ferocity of a Justin Smith of the 49ers and is 6’2″ 265#. He’s a guy that makes the other players around him better and I hope he ends up a Seahawk. Russells receiver from Wisconsin, ,Jared Abbrederis is one to watch too. I’ve been rewatching all 3 of Wilson’s losses and there are stand outs on both teams in those games. Ohio State has a very good defense overall and there was a lot more to Michigan State’s D than Jerel Worthy although he was the spark plug for them. It seemed like the D didn’t play well unless/until Worthy would make a monster play. Hi Ray – yeah I’m a big Simon fan and name-checked him in this piece. Under rated, great motor. Looking like a weak class. I think the guy that makes me the most excited is Justin Hunter, WR out of Tennessee. Looking forward though to 2014(I know wayyyyyy too early), I can’t help but be excited at the looks of the skill players. Players like Sammy Watkins, DeAnthony Thomas, Austin Sefarian-Jenkins, Michael Dyer, Marquis Lee, etc. It looks to be a fantastic class. IMO if the Hawks can trade out of the 1st and pick up a first in 2014 then I would do it. More picks for a likely STACKED class at the skill positions. If it’s sufficiently weak, you should see more than a few 3rd year sophs declare as Brockers did this past season. Potential type players get taken earlier in a weak draft. And given the new CBA, it’s all about the 2nd contract in terms of getting true market value. Getting the rookie contract behind you with productivity left on your body is going to be paramount. That reality, coupled with a draft with little ability to displace inconsistent, high ceiling prospects should make the 2013 draft class very attractive for very young players.